Dilworth is one of Charlotte’s oldest and most popular neighborhoods — it’s filled with charming homes, tree-lined streets, some of the city’s top restaurants and most well-known shops, and a favorite park. And the best part? It’s one of the few neighborhoods in Charlotte that is truly walkable. Nestled in between SouthEnd and Myers Park and just two miles from Uptown, Dilworth is the kind of neighborhood where people sit on their porches, run with baby carriages and walk to grab margaritas at their favorite bar down the street. Back in the ’80s you could get houses here for cheap; now it’s one of the premier ZIP codes in the city. Today we’ve got some of the can’t-miss spots in this favorite stretch of the Queen City. The Dilworth Tasting Room opened in the heart of the neighborhood earlier this year, taking over the old Dilworth Billiard’s space on Tremont. This 1940’s-style building is reminiscent of a European wine bar with an open air private courtyard and secret garden. There is always a new restaurant popping up in this part of town, but some of the old standbys are still the best. Wootten says he has been sending customers to 300 East for decades. 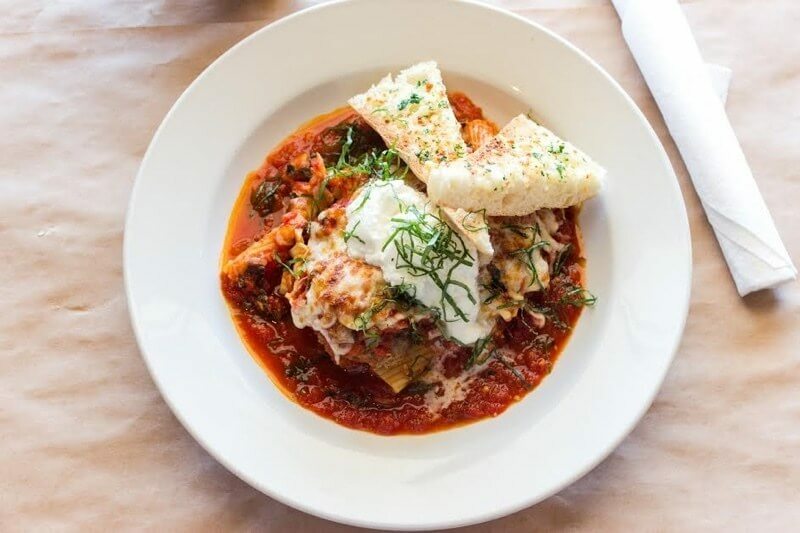 A neighborhood institution, this American bistro is located in the quintessential Dilworth house and offers classic foods done well. The neighborhood is also home to the original Brixx pizza — the perfect place for a quick bite with the family. Since opening last year, Kid Cashew has quickly become a favorite for its interesting Mediterranean fare and a “Living Libations” list offering spice-infused drinks. Bad Daddy’s Burger Bar is so popular with families it can get tough to get a table around dinnertime. Home to the original location, Bad Daddy’s offers build-your-own burgers with dozens of toppings and tater tots — yes tater tots — as a side! Bad Daddy’s made our list of “The 5 Best Burgers in Charlotte,” and you can see why. The Summit Room is known for their craft cocktails, unique menu and relaxing outdoor patio with a fire pit and rocking chairs. The same owners operate The Mayobird (the two share a space), where you can get the best chicken salad (and 12 variations of it) in the city. The Sunflour Baking Company opened their Dilworth location a year and a half ago and it has been packed ever since. SB TIP: If you want to snag one of their dangerously scrumptious chocolate croissants, call ahead and they’ll put one aside. They usually sell out by noon. Bakersfield Tacos is one of the busiest happy hours in the city thanks to their selection of more than 100 tequilas and American whiskeys and authentic Mexican food. Foxcroft Wine Co. Dilworth moved into the neighborhood in 2015 and became an overnight hit. The laid-back but upscale vibe is equally perfect for a GNO or date night. In addition to all the great wine, the menu offers great lite bites (the truffle fries and the Brussels sprouts are some of the best in the city). Paper Skyscraper is not only a local favorite, it’s also a national favorite. Yelp recently rated it “the number one independently owned gift store in the US,” and there’s a good reason. About a thousand good reasons, actually. What started as a tiny shop selling architecture books more than 28 years ago has grown into a gift shop offering everything from really funny cards, to beautiful jewelry and picture frames, to sweet-smelling candles and the perfect piece of cutlery. This is where you come for a hostess gift, a birthday gift … you name it! The owners have curated one of the best selections in town, offering something for everyone. You’ll find all sorts of playful items to purchase for yourself or a loved one. We featured this spoon rest, which reads “Rest in Grease,” in a previous FINDS article. Petal Boutique offers really cute clothes at great prices. McKenzie Claire is a little more upscale with some beautiful contemporary offerings from top designers. J Major’s Bridal Boutique offers more than 15 of today’s top bridal designers, and afterwards you can pop next door for some great deals at J.T. Posh, regularly voted the best consignment shop in town, where you can find gently loved Tory Burch purses and shoes, Lilly Pulitzer dresses, Prada and more. Every September (it’s the 7th through the 10th this year), the streets are clogged with cars as people try to get close to the Yiasou Greek Festival. Held at the Holy Trinity Greek Orthodox Church on the main drag of East Boulevard, it is one of Charlotte’s biggest cultural events, and this year they’ll celebrate the festival’s 40th anniversary. The other can’t-miss festival is Festival in the Park, also held annually in September (this year it’s the 22nd through 24th) at Freedom Park. You’ll find food and music here, and if you can’t make the festival, you should still check out the park. On a nice day, Freedom Park is filled with families laughing at the giant playground, co-ed groups playing volleyball, couples posing for engagement photos and dogs — lots of dogs, all dragging their humans around the pond. The city’s premier park, it is a 98-acre mix of fun and serenity that locals love to visit. It’s the perfect place to enjoy all that Dilworth has to offer!